One of the most creative and challenging phases of every interior design and interior decorating project is product sourcing, when the designer begins the process of finding, compiling and recommending finishes, fixtures and furniture. This is where designers truly shine and impress their clients with their creativity and resourcefulness. However, this can also be one of the most daunting tasks of a design project. As interior designers and decorators, we spend years building product libraries and our sourcing networks in order to bring clients beautiful, functional and unique products to compliment and distinguish their homes. While this is one of the most important and time consuming phases of a design project there is rarely enough time budgeted for it. In order to make sure that shopping and sourcing time is well spent, interior designers and decorators need to prepare and organize their sourcing objectives ahead of time. This work includes contacting vendors, visiting showrooms, checking on auctions, online research, combing through catalogs, compiling cut sheets and gathering samples. Options then have to be edited, a design framework formulated and complementary selections sourced at multiple price points. Get the picture? It’s a lot of work! Any designer who has ever visited a Design & Decorating building, carpet showroom, even a paint store knows that it is easy to feel overwhelmed by the amount of choice available. On the flip-side, some designers are working in areas where there may be clients but too little choice. In both cases, the process of selecting, requesting, borrowing (or buying) and returning samples is time consuming. Waiting on custom samples adds additional time. Maintaining an in-office product library can help but it requires space, a good storage system and office resources (or staff) to keep it organized and up-to-date. However, growing rent prices make having a library seem like a luxury and improved vendor websites make them seem like an out of date notion. Once you have finished compiling samples of finishes, fixtures and furniture for the project, you lay them out for your client to review. Despite your best efforts, many clients may still struggle to make selections. This is very common because many clients struggle to visualize a space. Imagining the size of a piece of furniture from a catalog or cut sheet in the actual room is difficult. Visualizing a paint swatch on a full wall or flooring sample across a whole floor can be particularly daunting. If they are unsure, then the whole sourcing process must start over again costing the client and the designer more time and money. As designers we know that the more selections that can be finalized before the project construction or installation begins, the better the outcome is for the client – the room designs will be more complete and the client will be more satisfied with the result. Therefore it is critical that designers hone their sourcing skills, develop time saving strategies and take advantage of new technologies and tools available to them. 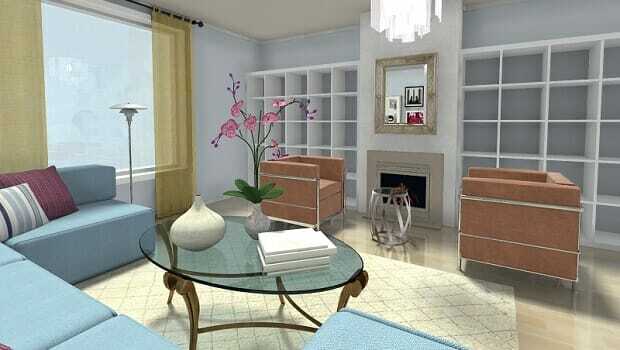 Now you can take your interior design sourcing strategy to the next level with stunning and realistic 3D visualization. RoomSketcher Home Designer allows you to visualize different finishes, fixtures and furniture options in 3D – quickly, easily and effectively. Create your design project floor plan in minutes. When the floor plan is done, start adding fixtures, finishes and furniture from the RoomSketcher Product Library which contains thousands of brand-name and generic products. Choose from brands such as West Elm, Crate & Barrel, Ethan Allen, Restoration Hardware, Ikea and CB2 to name just a few. While you draw, a 3D model of your floor plan is generated. An easy-to-use camera tool lets you take Snapshots of any part of your room design, so you can review product selections in 3D – as if you are standing in the actual room! The online product library allows you to have a wide variety of finishes, fixtures and furniture options readily accessible to start your selection process from. An easy to use drag and drop interface allows you to quickly swap out options- try different types of flooring, wall finishes, paint colors, as well as fixture and furniture layouts. Narrow your search efficiently by visualizing them in 3D- find the products you know will work and discover new options. Place a star on your favorite items to create a personalized quick reference library. RoomSketcher item properties are also adjustable. If you find an item you like but where the scale is is not quite right, resize it to determine the scale of the item that needs to be sourced. Dynamic product properties and 3D visualization helps you to fine-tune your product search. RoomSketcher state-of-the-art rendering allows you to create 3D Floor Plans, furniture plans and 3D Photos with realistic finishes at the click of a button. While sourcing, share your 3D Floor Plans and room designs with vendors, antiques dealers and custom fabricators to give them a better sense of the design direction. This enables them to pull and prepare better samples and selections for you- saving you time on sample gathering and turn-around. RoomSketcher projects are stored in the cloud! Have your design projects accessible for easy reference when shopping either online or “in-the-field” on any mobile device. Open your project in Home Designer on your laptop to visualize if a particular product type or size will work in your design. Dynamic item properties and 3D visualization enables you to make better choices when shopping. Present clients with your room design ideas with clear high-quality 3D Floor Plans and stunning state-of-the-art 3D Photos, either on-screen or download them to add to mood boards or presentations. Let your clients see how a paint color will look on a whole wall or how a flooring option will appear across the whole floor. The RoomSketcher Live 3D feature allows you to give clients an interactive virtual tour of the project design. With Live 3D clients can experience how product selections look and feel as if the are standing in the actual room. As they take a virtual walk around the floor plan they will be able to better visualize how paint colors, flooring and furniture layouts flow from room to room. With 3D visualization you enable your clients to make product selections easily and with confidence. RoomSketcher is easy-to-use and available online. We offer three subscription levels. The Free subscription lets you try out RoomSketcher Home Designer. When you are ready to generate high quality floor plans and use the more powerful 3D features simply upgrade. It’s that easy!